• Full range female voice time and date announcement. • Radio controlled with automatic summer/winter adjustment. 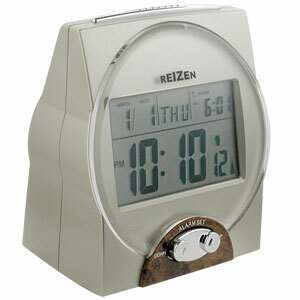 • Display time with running second, month, date, day-of-week, and alarm time. • Extra long 5 minute alarm sound, with beep tone and current time announcement. • High and low announcement volume selection. • Works on receiving the time radio signal. • Uses 2 "AA" Batteries (not included).